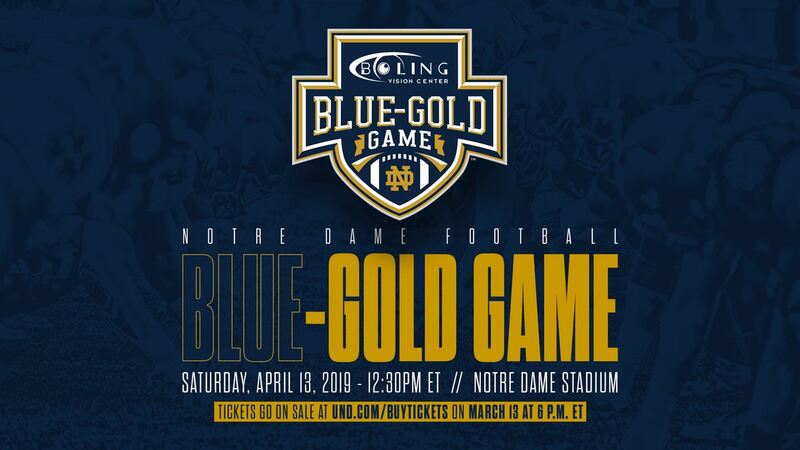 NBC Sports will present a number of innovative broadcast elements in its coverage of the 2019 Notre Dame Football Blue-Gold Game on NBCSN Saturday, April 13 at 12:30 p.m. ET, from Notre Dame Stadium in South Bend, IN. A dual Skycam will be deployed, including a sideline Skycam that will follow the line of scrimmage for every play. This will be the first time in television history that a sideline Skycam serves as the primary play-by-play camera. In a first for Blue-Gold, the game will be produced in collaboration with members of the Notre Dame Fighting Irish Media staff and current Notre Dame students from the Notre Dame Studios at Corbett Family Hall within Notre Dame Stadium. NBC Sports worked with Notre Dame Fighting Irish Media to produce Notre Dame hockey games this past season. Paul Burmeister will handle play-by-play duties for the game alongside Notre Dame Football on NBC analyst Chris Simms. Heisman Trophy winner and Notre Dame Football on NBC analyst Doug Flutie will report on the field throughout the game, located behind the line of scrimmage to provide a unique perspective on how the offense operates: from the quarterback’s point of view. NBCSports.com and the NBC Sports app — NBC Sports Group’s live-streaming product for desktops, mobile devices, tablets, and connected TVs — will stream coverage of the 2019 Notre Dame Blue-Gold Game.